We would visit Salem often in the early 2000s and loved the history, culture, and vibrancy of the city. It was a place that always held special meaning in our hearts. After some years living in the metro D.C. area, we decided to move back to New England, and Salem was the obvious choice—it had just the right amount of kitsch and character we were looking for. We both became really involved in the community and incredibly interested in the history and preservation of the city itself. My name is Wendy van Wilgenburg, and I am a visual anthropologist and documentary filmmaker focusing on craftmanship. I have made films on master craftmanship for over twenty years and decided to found the Craft in Focus Festival to engage a large audience with the beauty of handmade objects. 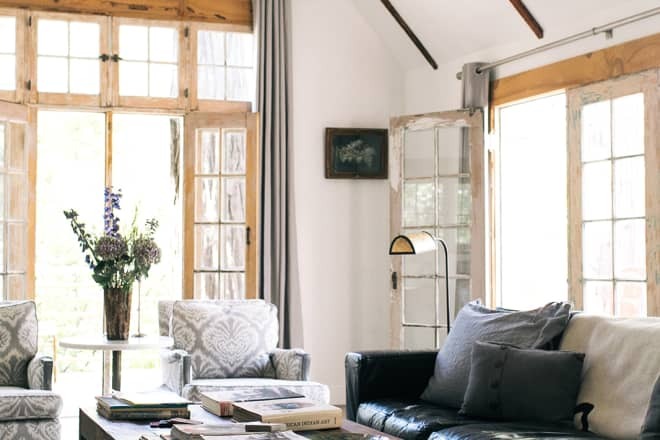 New England-based interior designer Jess Cooney worked reno magic on an old carriage house a few years ago. Everything from an exterior paint job to a complete refresh of the interior transformed what was an outdated, dark space. Though she sold the home a little while ago after buying the original main house next door, her careful contemporary remodel of the structure’s charming architecture is worth studying for inspiration. When we first saw the fabulous bungalow home at the end of a quiet cul-de-sac, we were smitten. The interiors were mostly original and there was a giant blue farm sink in the kitchen, original to the house. Regretfully, the sink was completely impractical but we are turning it into a potting sink in the garden. We paid homage to the sink by painting the cabinets blue and getting a cute blue dualit toaster. Michaela Grut comes from a creative family—there have been artists in several generations of her history. So it comes as no surprise that she’s found herself in a career that stretches her artistic muscles. Jessica has filled each room of her home with unique finds, DIY elements, and vintage pieces to create a warm and welcoming environment. On her blog, House Homemade, she shares her passion for creating a cozy home and demonstrates how to recreate her favorite DIY pieces. She recommends shopping around your own home and switching furniture between rooms to keep your spaces fresh and interesting (which she does quite often in her own home). Kirsty and Simon moved to Victoria’s coast from Melbourne when they realized they were spending nearly every weekend there to feed Simon’s addiction to the Australian surf. It’s been a love affair ever since, with weekends spent cooking, surfing, gardening, and enjoying the relaxed coastal lifestyle. Their daughter, Mali, has only ever lived on the Great Ocean Road, and now they can’t imagine going back to the city. Their home is a tapestry of textures, fibers, and gathered natural and vintage ephemera and is a tribute to their dedication to sustainability. Our home was built in 1751 in western Massachusetts on a south facing knoll. It sits alongside an abandoned apple orchard that backs up to a small mountain populated with all kinds of wildlife. In the orchard during the growing season, our flock of sheep and lambs graze and rest, graze and sleep. Just outside my basement studio door, I grow a large flower and veggie garden.